Jim is a young college student. See Jim get a 110 camera for Christmas. Look! Look! See Jim take a train ride. 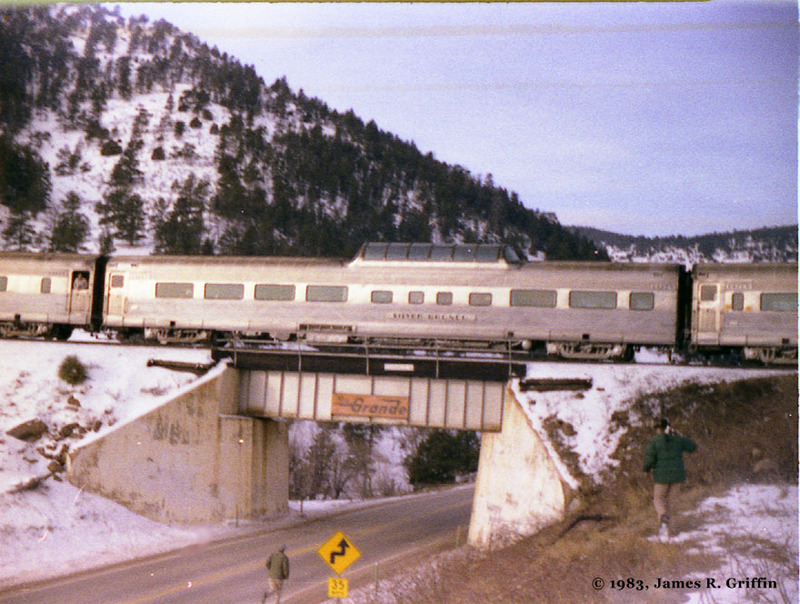 Jim is going to Glenwood Springs on the Rio Grande Zephyr! Ride, Jim, Ride. 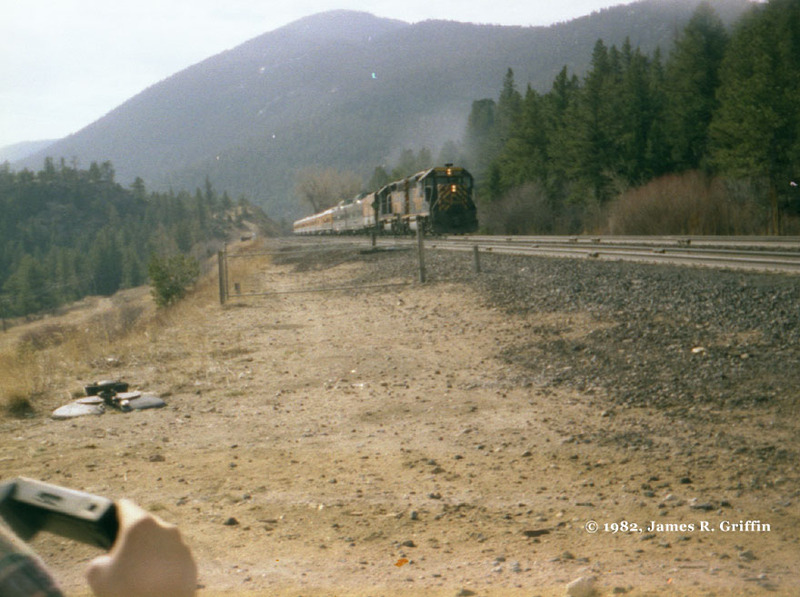 See Jim turn into a railfan. Look! See Jim take pictures with his 110 camera. Shoot, Jim, shoot. Jim does not have a clue about photography. See cousin Dan. See Dan’s camera. It is just like Jim’s camera. It is also cheesy. See Jim and Dan not care. See Dan and Jim wake up early on Saturday morning. See them drive out to the train tracks. Oh, how cold. Freeze, guys, freeze! See them freeze to the ground. Jim and Dan do not care. They see headlights. 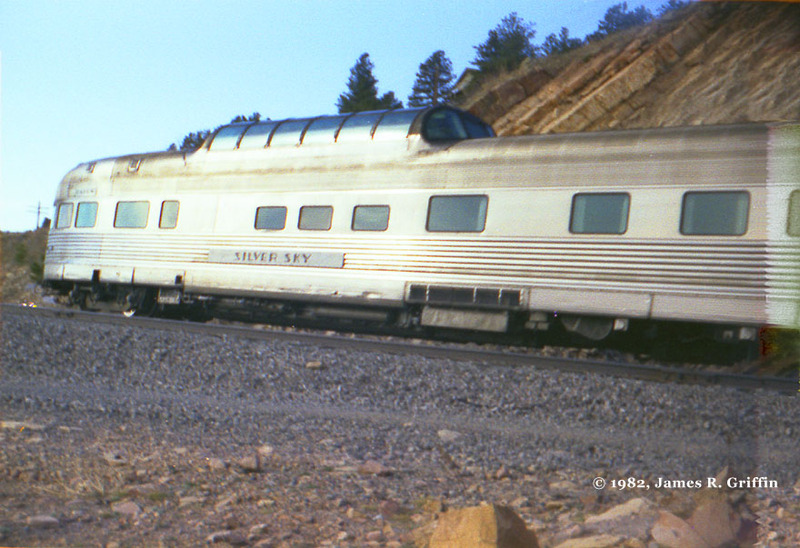 Oh, see the pretty F9 trio and shiny Budd-built stainless-steel passenger cars, of California Zephyr vintage. Pound, heart, pound! 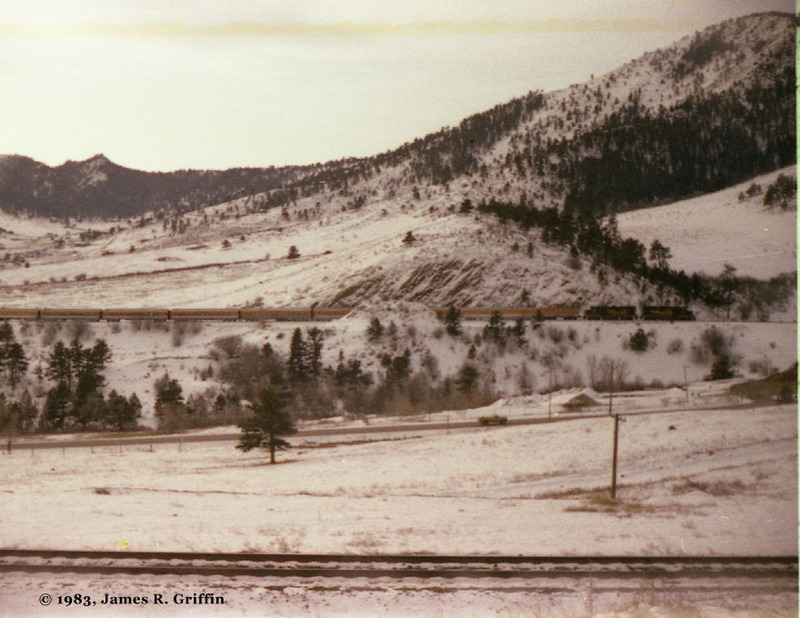 See Jim and Dan take many low-quality photographs of the classic train with the distinctive vista-domes. See Dan and Jim discover the Ski Train. See them find little dirt roads they never knew existed. Jim is learning about trains. Dan is learning too. He learns his cousin is obsessive-compulsive with a train fetish. Now the people wait many years. They wait twenty-three years. * Age, people, age. Now see Jim turn into a webmaster. See Jim with his Epson Perfection 3170 Scanner with transparency capability. See Jim’s 110-size negatives. Scan, Jim, Scan! Now Jim will post pretty pictures on a web page. 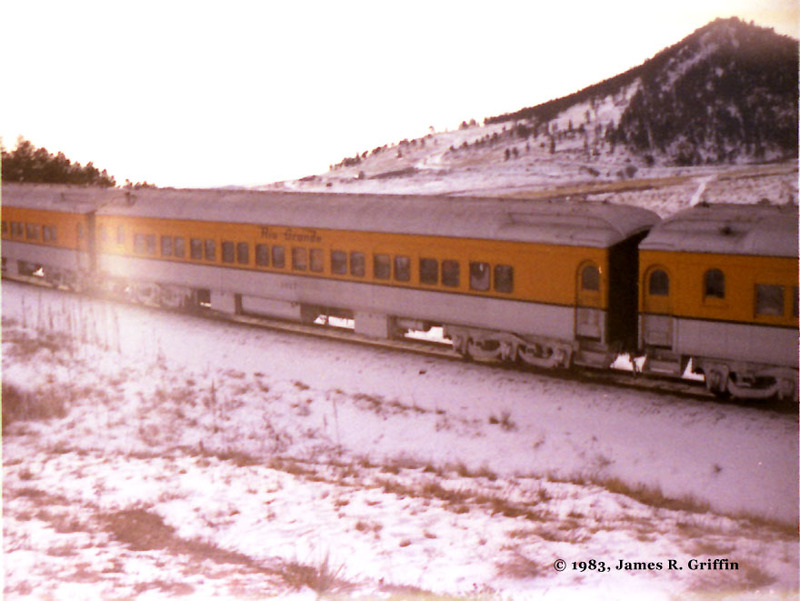 Jim posts old pictures of neat trains. See Jim wish he had borrowed Daddy’s nice 35mm SLR camera back then. Sigh, Jim. Sigh. Jim is still glad he has the 110 pictures. Jim says they are better than nothing. Jim says, that is what Photoshop is for. See the calendar. See the page say January or February 1982. Jim cannot remember. Jim did not keep track. Jim is a doofus. 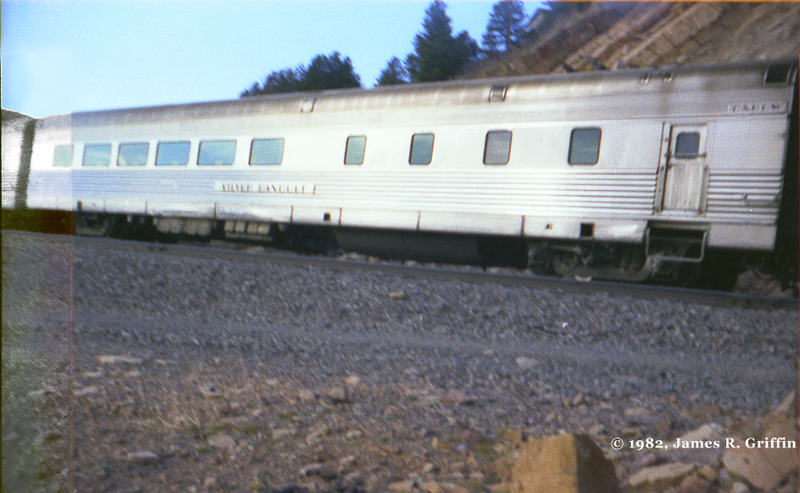 One day in January 1982, my cousin & I went down to the mouth of Coal Creek Canyon to see if we could photograph the Rio Grande Zephyr. We parked at Blue Mountain crossing and walked east to wait. It wasn’t long. You would hear it coming for a long time. 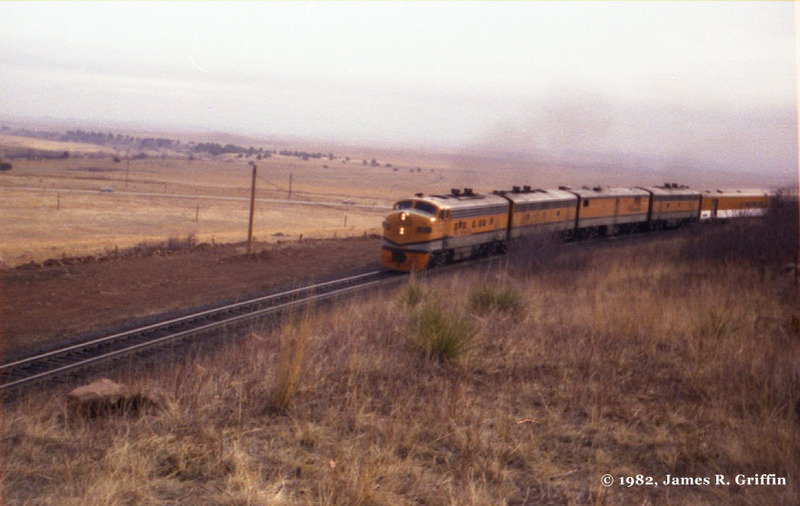 Up through Rocky, around Little Ten and Big Ten curves, along the shelf at Clay, the mutter of the 567 diesels in the F9 locomotives of the approaching Rio Grande Zephyr took an eternity until it finally came around the final curve before Blue Mountain crossing. Today the train was shorter than usual– two dome coaches were on the Mayor’s Ski Train special a few minutes behind, although we didn’t know that just yet. Who knows why I didn’t take more photos of the train this morning. Probably, I was still in awe of the whole experience. Fortunately, I did have the presence of mind to take photos of the parts that had me curious since my ride the previous November. Here is the steam generator car, No. 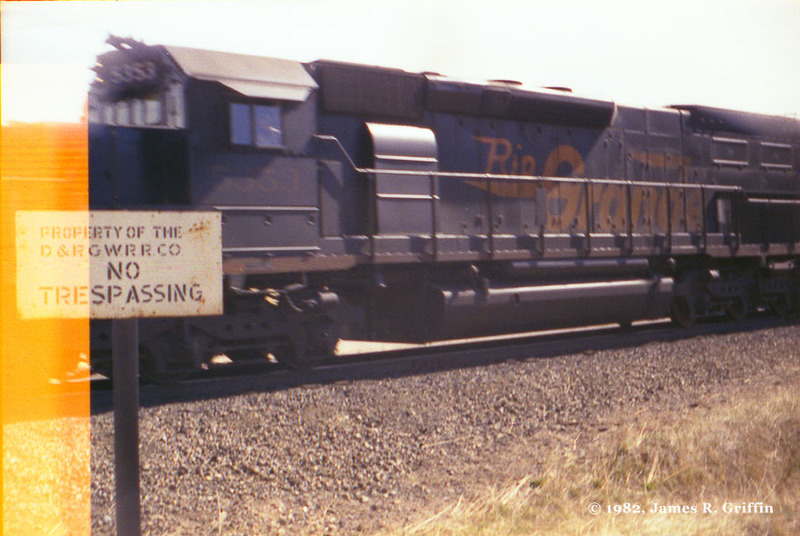 253, formerly an Alco PB-1 locomotive. The prime mover was removed in the late 1960s and the three-axle trucks were replaced a couple of years prior to this shot. Right behind the locomotives was this car, a baggage combine (No. 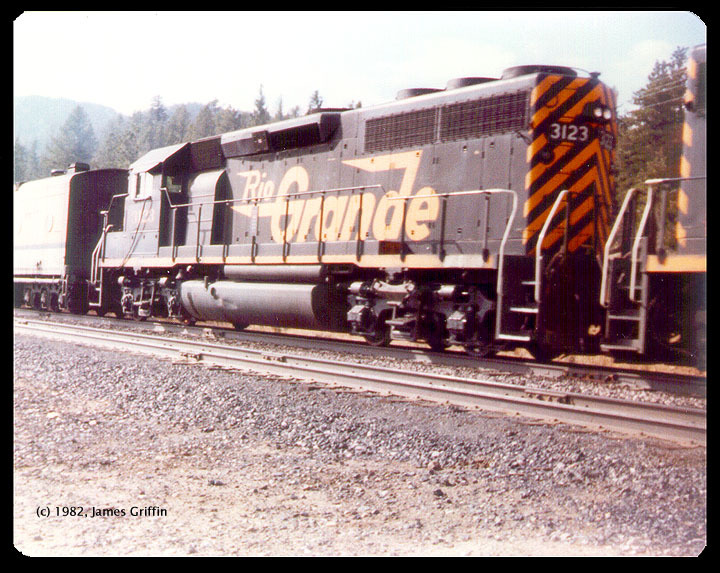 1230) whose origins trace back to the Rio Grande’s Prospector train. 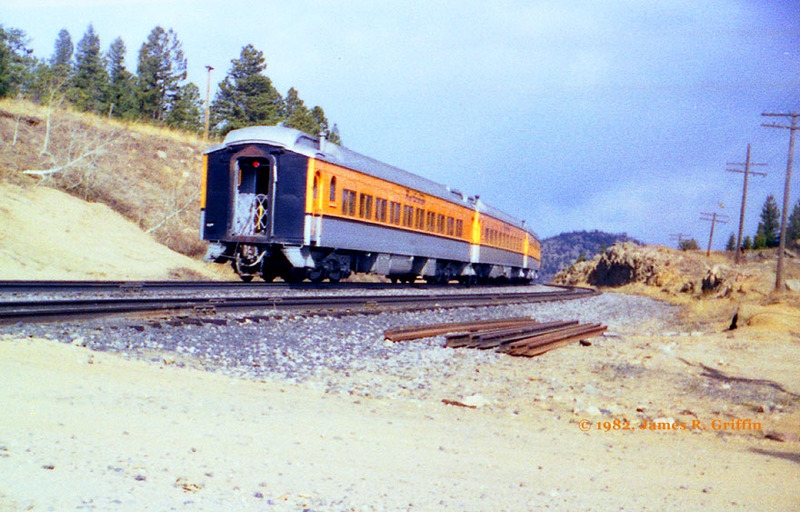 The Prospector was an overnight train between Salt Lake City and Denver, and it had been equipped with then-new Pullman-Standard cars in 1950. There were two of these combines, both still active when these photos were taken (as we shall see). 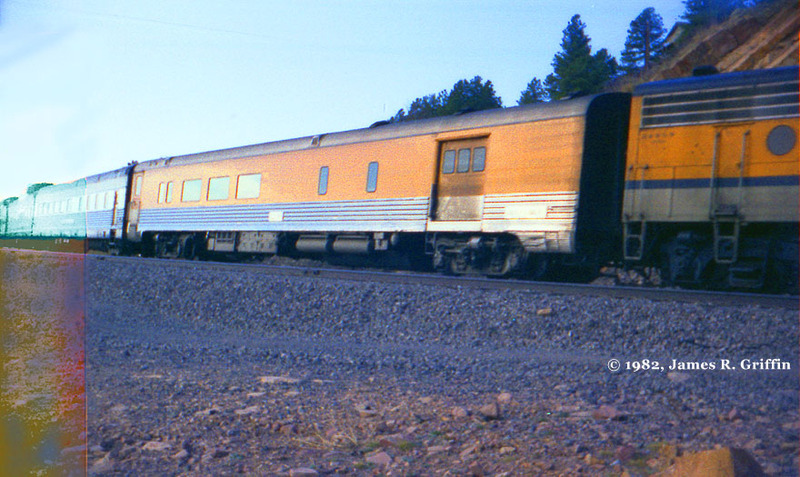 When the California Zephyr was discontinued and the Rio Grande Zephyr took its place, the CZ’s stainless-steel baggage cars were dropped from the train and the combines used in their place. It was a matter of economics– there usually wasn’t that much baggage on the RGZ, and the combines contributed a number of extra seats (and a place for the conductor to work). Two cars for the price of one, basically. Of course, I knew basically none of that background information at the time. Well, we decided to hang around, and shortly heard the approach of another train from the east. It was the Ski Train! Now, remember that we didn’t even know of the existence of a Ski Train at this point in time. We just saw a passenger train approaching, in Rio Grande colors, but with a couple of dome cars on the front end. What’s that about? Notice Dan’s hands holding his camera in the bottom corner. My camera was basically identical. 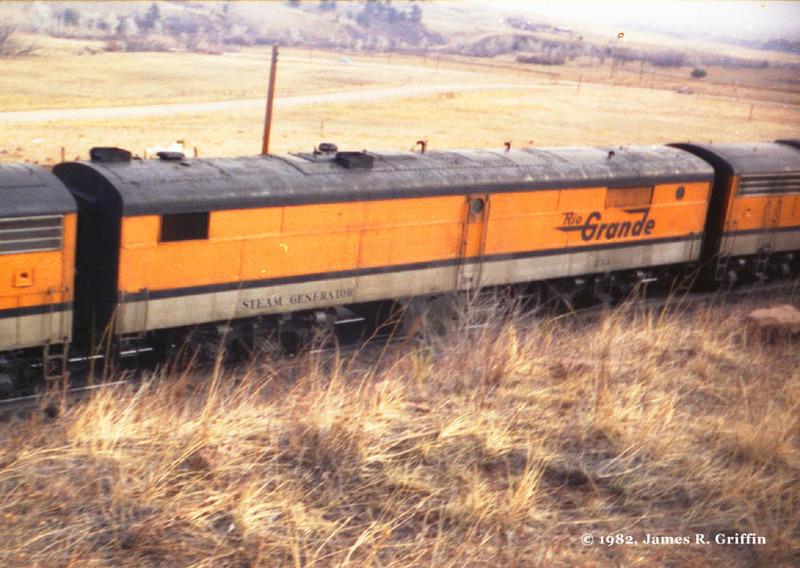 There was a pair of GP40-2 locomotives on the head end, followed by… another steam generator car. This one, I found out somewhat later, was actually built from a leftover tender from a steam locomotive (Baldwin). That’s fairly obvious, actually. By the way, notice the jointed rail on both the main track and the siding. Here’s a better look at the steam generator car. It was No. 251. The consist had the two locomotives, the steam generator, a pair of dome chair cars that usually ran on the Zephyr, a combine (No. 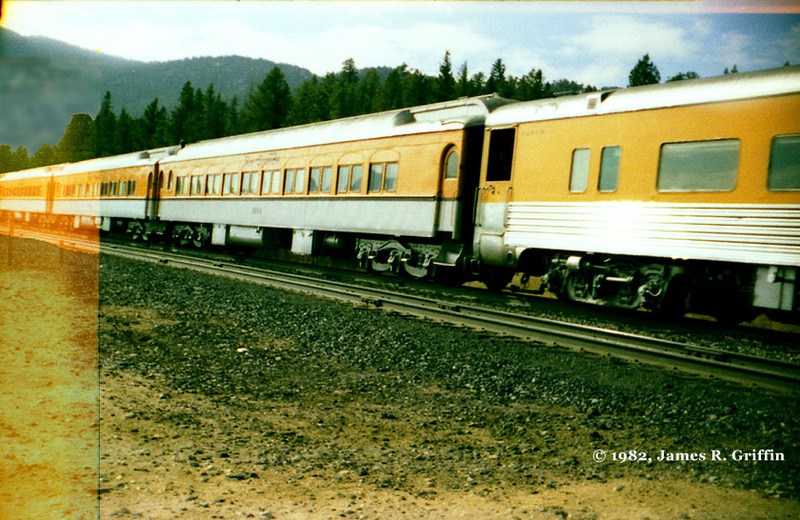 1231), and eight heavyweight coaches that usually comprised the Ski Train. 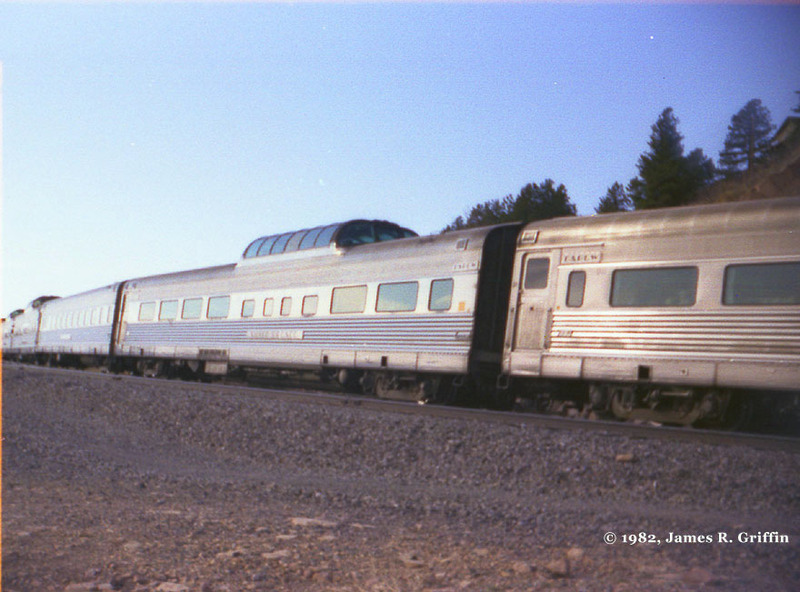 That’s eleven cars, plus head-end equipment– not bad for a non-Amtrak train in 1981. To this day I do not understand why I didn’t take any photos of dome cars on this day. Here we see the combine and the first of the Ski Train cars. 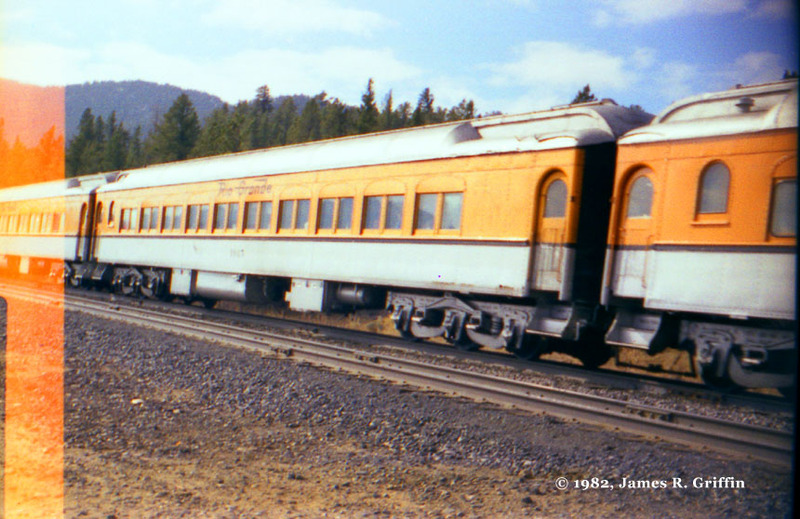 They were built around 1910, and later were acquired from the Northern Pacific by the Rio Grande. Here’s another look at the heavyweight cars. Quickly the train was past, the tail end receding around the curve from which Crescent gets its name. Gross Dam road is in the foreground. 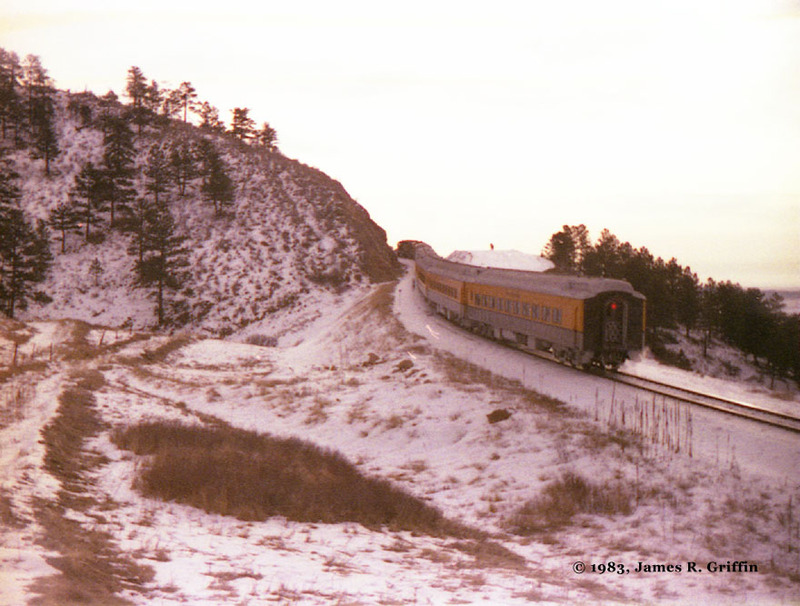 On another day later in the winter of 1982, we decided to go up to Plainview and photograph the Zephyr as it passed. Whereas the weather had been temperate on the previous outing, this day it was cold, cold, cold! And windy, too. We hiked up to Rainbow Cut at the north end of the siding, but the wind was so bitter that we couldn’t bring ourselves to climb up to the high point. Instead we huddled below the grade and tried to keep our hands warm until the train got there. This picture of Dan’s shows the train approaching the curve. It was much closer to a full consist this day. No. 1230 was doing combine duties again. There’s a slight spotting difference between her and sister 1231: notice the small windows between the baggage door and the main windows in the seating area. These windows were removed from No. 1231 in the distant past. Today, dome SILVER BRONCO was the second dome in line. The car ahead of it was either the SILVER MUSTANG or SILVER COLT– notice the small conductor’s window next to the door. Bringing up the markers was SILVER SKY. Often, the business car WILSON McCARTHY would be coupled behind her, but not today. After this we hustled back to the car and cranked up the heater. We weren’t done for the day, so we headed back to Blue Mountain crossing. We were quickly rewarded by the arrival of a westbound manifest freight. Actually, it had warmed up a little by now. Incidentally, looking up-sun at the train is not a good way to get a detailed photo. 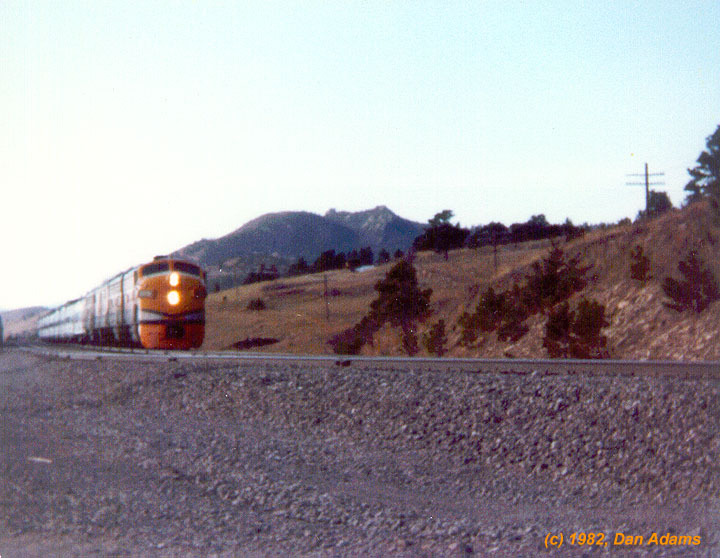 The lead unit was SD40T-2 No. 5353, one of the so-called “tunnel motors”. Of course, at this time I’d never even heard of a tunnel motor. I saw six axles and automatically assumed it was an SD45! Even as late as the following summer, I thought that these were SDP-40s that had had their steam generators removed. I’m so ashamed. Here’s Dan’s photo of the trailing unit, GP40 No. 3057. Fast-forward a year to the winter of 1983. 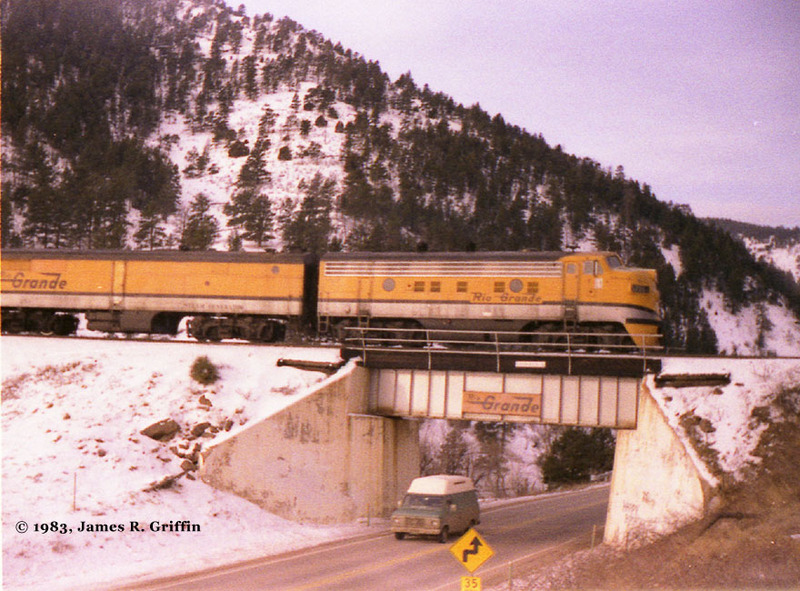 In the interim I had gotten married, ridden the RGZ to Glenwood Springs on our honeymoon, and expanded my overall train knowledge a little. 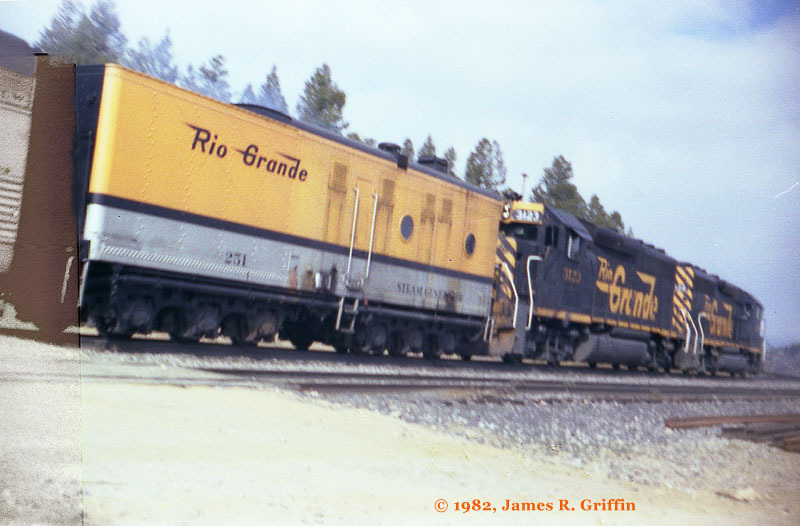 By this time it had also been announced that Rio Grande was divesting itself of the RGZ operation and selling the route to Amtrak. Given that last item, one would think I had spent every free moment out chasing the thing. Well, having a job that puts you at work at 7:00 AM every Saturday has a way of crimping that kind of activity. Nevertheless, we did manage to get out to Coal Creek at least once, in March from the look of things. Believe it or not, this particular outing’s goal was to shoot the Ski Train, not the RGZ! As it turned out, we arrived there in time for the marquee train, and I of course took a few photos. It seemed that half the city of Denver was out there that day, all shooting their penultimate shots of the train. Here she is, approaching the Colo. 72 overpass. We had barely gotten there in time for her passage. By this point in time, the steam generator car was nearly always present, and you can see the diner just behind the power. The head end is crossing the bridge. I bet the multitudes of railfans were a tad upset at the driver of the van, who chose that exact moment to drive under the bridge! Today the steam generator is running ahead of the two F9Bs. There was a reason for choosing SILVER BRONCO for a picture, out of all the cars in the train. We had ridden her on our honeymoon the previous August, when she had been the lead dome and we had the front seats. Today she was running just ahead of the dome obs car SILVER SKY. You can see the photogs running for their cars before the train was even past! Chasing it up the mountain, no doubt. See Jim choose a place to take pictures. See Jim get down-sun from the train track. Dumb, Jim, Dumb! Jim does not know squat about light, does he? So, explain to me why I didn’t take at least one photo of the train approaching, when it wasn’t backlit. 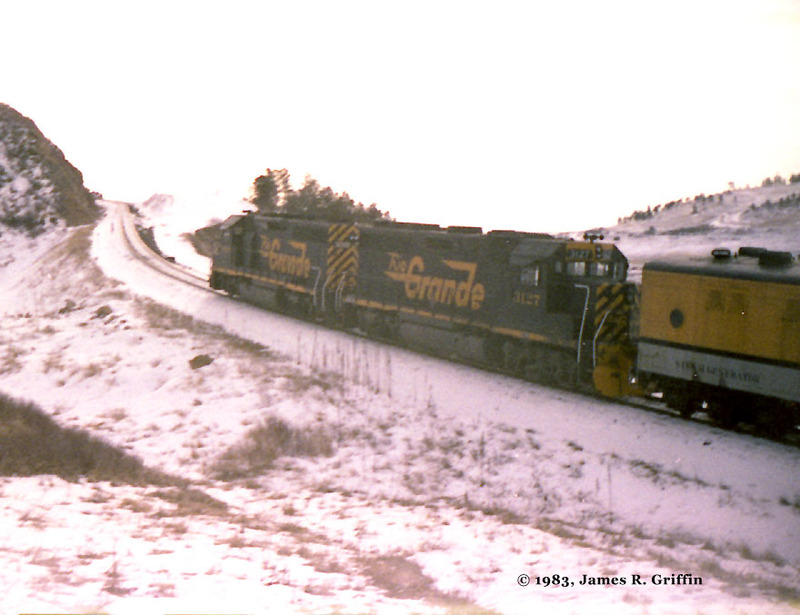 Well, here we have the power suite moving up the hill to tunnel one, with GP40-2 No. 3127 and what looks like possibly No. 3099 leading. I do remember how they fairly shook the ground as they climbed the hill with the train. Here you can really see the effect of the sun, which was weak but nevertheless evident. The ancient coaches certainly looked sharp in their silver and Aspen Gold, though I’m told that the interior was a different story. Going away, the Ski Train passes around the curve leading into tunnel one and the rest of her trip. 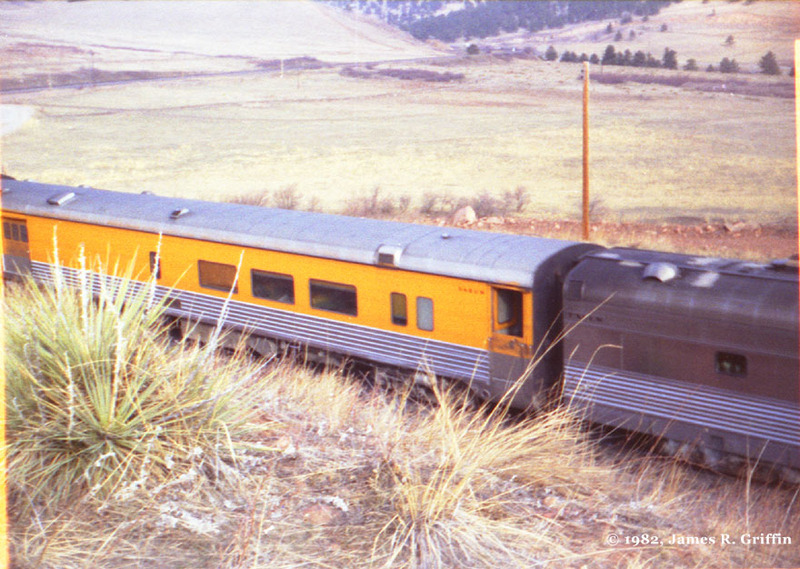 As it turned out, these were the last photos I ever took of the Rio Grande Zephyr. Her last run came about a month later, and on that day I opted to try for movies instead of stills (this was pre-camcorder days, remember). I should have taken both, as the 8mm camera malfunctioned and the results were incredibly disappointing. The Ski Train, on the other hand, survived longer. I was able to shoot it the following year, both with 110 and with a real camera. The old heavyweight cars served until 1987, after which they were replaced with the much-newer equipment that operated up to the end in 2009.. 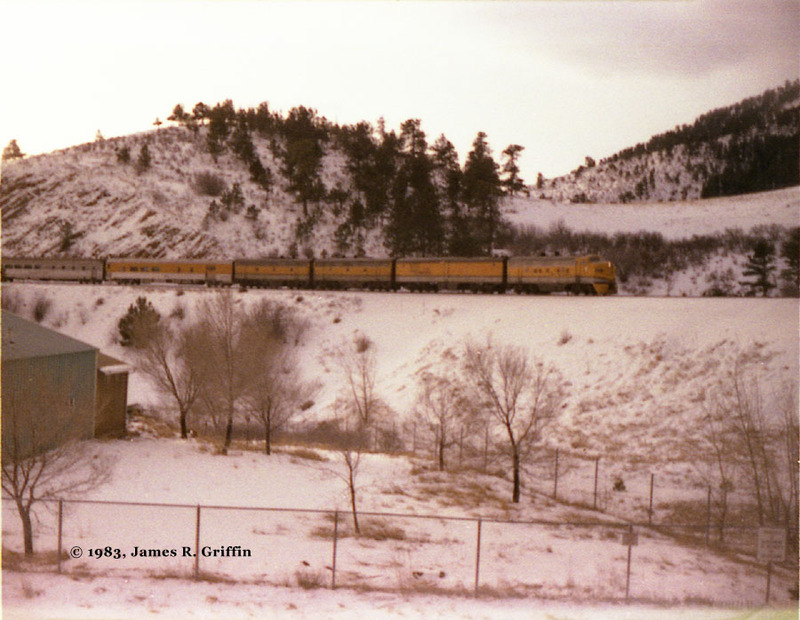 The days when one could see two regularly-scheduled (public) non-Amtrak passenger trains on the same railroad– on the same morning– are gone forever, though I didn’t realize it when we were standing in the snow clutching a little Insta-matic camera one day back in 1983. Amatuerish? You bet. If only a person could go back in time and change things, like, take along a good camera! But despite this, we got to record some irreplaceable images, create some indelible memories, and experience something that is gone and not coming back. I love modern railroading, but I sure miss the Rio Grande. 110-size film (10-mm width) is not exactly the photographer’s medium of choice. There just aren’t enough grains to work with. Plus, the cameras that use it do not have the best optics in the world, to say the least. But I figured that I might get better image results from scanning the negatives than working off of 20-plus-year-old prints that have begun to fade. It turns out that there is a lot more image on the negative than made it onto the original prints. However, something about the processing of 110 film introduces large magenta blocks between the frames (prints yellow). Usually there is usable image above and/or below the block, and usually one can “see through” the block. I discovered that there was much interesting content towards the edges of the frames that I never knew existed, so I decided to attempt to recover these parts. Photoshop helps a lot with color shifting and filtering. Even so, there’s only so much one can do before he finds himself effectively re-drawing the image, and I try to avoid that whenever possible. At any rate, you will see that many of these photos have yellow regions, or areas that seem to have something wrong with them, and this is why. I chose not to crop some of these areas, simply because the screened content was too interesting to throw away– despite the annoyance of the color shifts and resolution loss.